From China to France to Sweden...with a little bit of home in-between! Since I last blogged I have been all over the place! 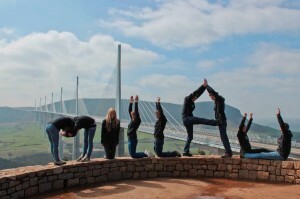 If going to China wasn’t adventurous enough, the GB team then set off to Millau, France to compete in the next round of the 2013 IFSC Boulder World Cup. Home for two days and then it was time to head to Stockholm for the 2013 Tierra Boulder Battle. This event was great, I think it was the best one I have done so far! An all girl competition: Alex Puccio, Melissa Le Neve, Anja Hodan, Therese Johansson, Matilda Soderland and me. We set boulders, tested them, played around with fancy dress, did photo shoots, took saunas, saw the sights of Stockholm, drank copious amounts of coffee, competed and then partied! It was such a good weekend! I really enjoyed the climbing and was pleased to come in 3rd place in the competition. Some fancy dress and make up! CAC had a good presence this weekend too! Now a bit of time at home to top up the training, climb outside and take a deep breath or two before heading to Kitzbuhel next week!